welcome to part 2 of the history of Panel de Pon if you missed out on part 1 be sure to check it out! As a tie-in to the second generation of Pokémon games, the first, last and only GBC Panel de Pon game was Pokémon Puzzle Challenge (in Japan, Pokémon no Panepon). This game retells the Johto Quest... Panel de Pon-style! Compared to Tetris Attack GB, I found this one to be noticeably faster. And of all the Panel de Pon games I've played, I'd say this one is the hardest! See, as you progress in the main Panel de Pon campaigns, you collect other characters in the game; think of them as tokens or game pieces. The criteria you need to meet in order to trigger the battles to capture more Pokemon are brutal, as are the Vs. Matches with the CPU! I found catching 'em all to be difficult! A playable build of Panel de Pon GB is hidden in the game's code and is accessible through an elaborate code on GBC, or by pressing pressing the A Button 24 times, then the B Button 24 times on regular Game Boy and Super Game Boy. Besides the GBC release, Pokémon Puzzle Challenge is also available on 3DS Virtual Console in North American and in PAL Territories. A mere 4 days after the Japanese release of Pokémon no Panepon, Pokémon Puzzle League for the N64 rolled out into stores across America and Europe. Japan didn't get this one! Much like Statropics or Super Punch Out, this is one of those few Nintendo games that was not intended for a Japanese release. Pokémon Puzzle League was developed in the United States at Nintendo Software Technology, the same division of Nintendo who developed Bionic Commando: Elite Forces and Ridge Racer 64, and would later go on to develop Wave Race: Blue Storm and Mario vs Donkey Kong. As an American, I can't help but feel a sense of pride when a Nintendo game is made in the US of A.
Pokémon Puzzle League is loosely based on the first two seasons of the Pokémon TV anime. Ash, Pikachu, Squirtle and Bulbasaur go on an adventure to take on "The Puzzle League". The English voice cast is all here, it has a few (highly compressed) cutscenes and plenty of voices and quotes. It might seem gimmicky, (it is) but this all worked for me as a kid! It's almost like a lost episode of the anime that you can play through. It's the tried and true Panel de Pon formula so not a whole lot of deviations to the game play. The major discrepancy would by the cylindrical 3D puzzles in the Line Clear Mode, which I found to be obnoxious. All the "3D" does is obscure your field of vision. Didn't like 'em. Regardless, I still go back to this one pretty often. For better or worse, Pokémon Puzzle League shaped the US/European identity of the series going forward. "Puzzle League" would be adapted as the official name of the series in those territories due to it being trademark-friendly. In 2003, a new version of Panel de Pon would be made for Nintendo Puzzle Collection on GameCube, collected alongside Dr. Mario and Yoshi's Cookie to make the Nintendo Puzzle Game Trinity. ONCE AGAIN.... region-locking is an issue and the game is confined to Japan! What gives!? To cut a little bit of slack, it was shown at E3 in 2003, which makes me think that it was gonna have an American and European release, but that didn't pan out. I was following the development of this game at the time and was crestfallen to learn that it would not reach American soil. The version of Panel de Pon in Nintendo Puzzle Collection is kind of like a remake and a sequel to the original at the exact some time. I don't have much experience with it. It was never re-printed, re-released or ported. There's a few new game modes, the music is the same, but cleaned up a bit; the characters look a lot like the original Panel de Pon characters but are rather their descendants. The Game Boy Advance was a great console for remakes and ports. 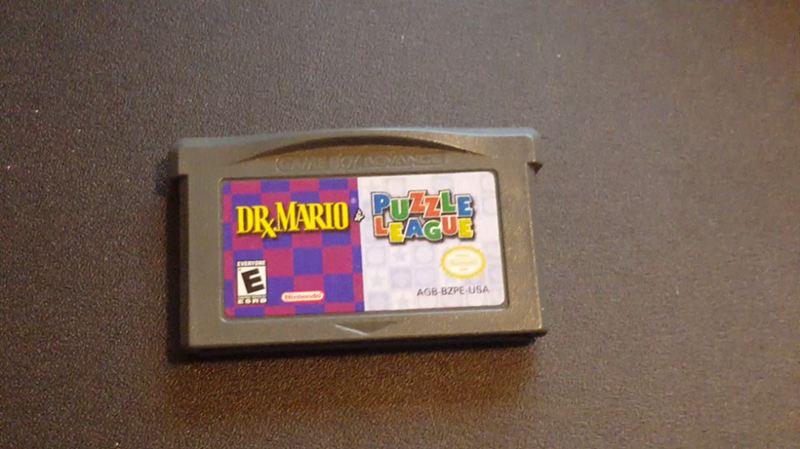 In fall of 2005, Dr. Mario & Puzzle League (Dr. Mario & Panel de Pon in Japan) graced the small screens of the Game Boy Advance owners who forked over the cash to buy it. This two-in-one cartridge collects... I don't need to say what games it collects, you know what games it collects. Because Americans and Europeans didn't get Nintendo Puzzle Collection, I find this release to be a half-hearted apology for us missing out. While the version of Dr. Mario in this collection is fine, I can't say the same for Puzzle League. It's functional, it's playable, but this version of Panel de Pon is so... drab. It's the most basic skeleton of a Panel de Pon experience. No characters, no pretense of a story.... there's not even a "Puzzle League" to battle! If you're gonna get this cart, I'd say get it to play Dr. Mario on your GBA. You have better Panel de Pon options. The most recent Panel de Pon to be released in a physical format was Planet Puzzle League (Panel de Pon DS in Japan) for Nintendo DS in 2007. With dual screens and stylus controls, this was part of The Big N's Touch Generations campaign. The packaging boasts that with Nintendo Wi-Fi Connection, you can play with people all over the planet! Much like Puzzle League on Game Boy Advance, Planet Puzzle League is spartan in terms of presentation. It eschews all the characters and storylines, but I think it has a little bit more going for it than the last release. There's a few stages to pick from and you can even scroll through a few block designs. The game has an "alien geometries" look and the music has a spacey, techno vibe to it. Daily Play Mode is a once-per-24-hours Score Attack mode where you can chart your progress (or lack thereof) over time. I've played all the Panel de Pon games, and I'd say this is the easiest one. On average, I can last in Endless Mode for about 20 minutes. Players who have more skill than me have found some crazy exploits and combos that you can pull of with the stylus. All the power to 'em! The Japanese version had Lip, her stage and theme song, hidden in the game. Of course, it's removed in the Planet Puzzle League versions. ONCE AGAIN... LIP GETS SHAFTED! WHAT THE HELL? This is a stripped down version of Planet Puzzle League for DSiWare. I don't see the point. A minigame in Animal Crossing: New Leaf that you can access with an Amiibo. Finally, I'll confess that I had been championing Lip as a fighter in Super Smash Bros. for a long time now. I thought she might of had a mild chance to get into Smash Ultimate, but she was eventually revealed to be a Smash Spirit instead, thus shattering my dreams. Eh, maybe next time. Maybe. That just about covers the entire series. Panel de Pon has a had a long, troubled, turbulent history. Of all the original Nintendo puzzle games, it's my favorite, so I hope y'all walk away from this a little bit more educated. Maybe you might be inspired to go track down one of the games, and you can do so with my blessing!